If you aren't already using one of the many NFC-enabled mobile payments apps out there, Walmart has another one for you to try. 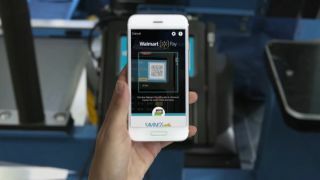 Called Walmart Pay, it's going up against the likes of Apple Pay, Samsung Pay and Android Pay, but instead of using a touch-to-pay NFC chip system, Walmart's offering uses a QR code. It works more like Starbuck's mobile payment solution, which has an app built around its loyalty program through which you can also add money to your Starbucks account to pay for purchases with your phone. Walmart Pay, which lives inside the Walmart app, lets you add credit cards, debit cards or a gift card to your Walmart account, and you can secure this part of the app with a passcode or Apple ID. During in-store checkout, you scan a QR code available at the terminal using your phone's camera. The Walmart app also includes other features, like storing shopping lists and receipts, plus lets you refill pharmacy prescriptions and arrange pick up for online orders. Walmart has thus far chosen not to support NFC-supported mobile payment systems, meaning it hasn't yet extended a hand to Apple, Samsung and Google's mobile payment options. Still, it's interesting that Walmart has chosen to launch its own mobile payment system after all. Walmart is part of the Merchant Customer Exchange (MCX), which had thrown its weight behind a QR code-based payment app named CurrentC that was scheduled to launch this year, but was delayed. This isn't to say that Walmart won't support CurrentC in the future - or even the other major NFC-supported mobile payment systems - but the retail giant says it has focused on making a system that isn't restricted to certain handsets, or even by credit/debit card types. "We made a strategic decision to design Walmart Pay to work with almost any smartphone and accept almost any payment type - even allowing for the integration of other mobile wallets in the future," said Daniel Eckert, Walmart's senior vice president of services. Walmart says that 140 million customers head into its stores every week and around 22 million of these use its app every month, so it's more than likely these customers will try out Walmart Pay as well. You can check out Walmart Pay in action in the video below.